As the Silver price has dropped below AUD$20.00 and silver sales are at an all-time high after years of flatlining, we consider the reasons why the current pricing is unlikely to remain at this level. 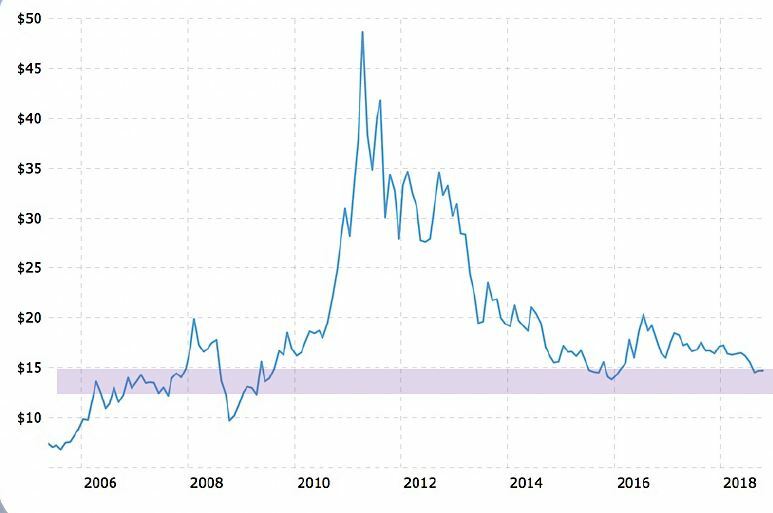 Silver has been in a severe bear market since the price peak of April 2011 falling approximately -70% in price from the peak of US$ 49.82. As you can see from the chart on the right; silver is again at levels last seen as far back as the year 2006. So, what should an investor think at this point? Stay away from the white metal at all costs or jump in while prices are low? Apart from just looking at this chart, there are many indicators that the silver price will rise and continue rising. The cost of mining metals is an enormously energy intensive business and hence the price of oil is one of the major components of the business model and the cost of production. Ore grades have collapsed between -40% to -50% globally. 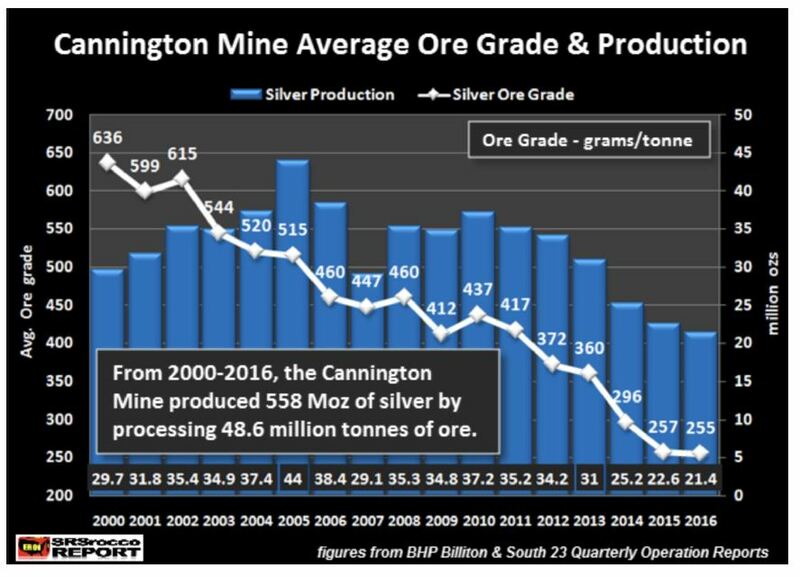 Cannington Mine, one of the world’s largest silver producers are clearly indicating the trend underway. Effectively the silver producers have to process near double the amount of ore to produce the same amount of silver when comparing 2006 to today, and hence oil / energy consumption has in effect doubled. When comparing like-for-like, the mining production from 2006 against today in 2018, miners are essentially paying 140 US$ price for oil (70$ present price x 2), the actual peak of oil in 2008. This cost of production simply cannot be sustained with silver priced at today’s levels, either the cost of production has to fall substantially, or silver prices have to rise considerably. Global supply/demand deficits have been recorded every year for the last 14 years consecutively. The metal is coming from stockpiles gained and built during surplus years in the 1980’s and 1990’s. This stockpile, however, is being whittled away very quickly due to these on-going deficits. In fact, global silver scrap (re-cycled) supply fell to its lowest level in 26 years. World silver recycling in 2017 has dropped by nearly 50% since its peak in 2011. According to the 2018 World Silver Survey, global silver scrap supply declined to 138 million oz (Moz) compared to 261 Moz in 2011. 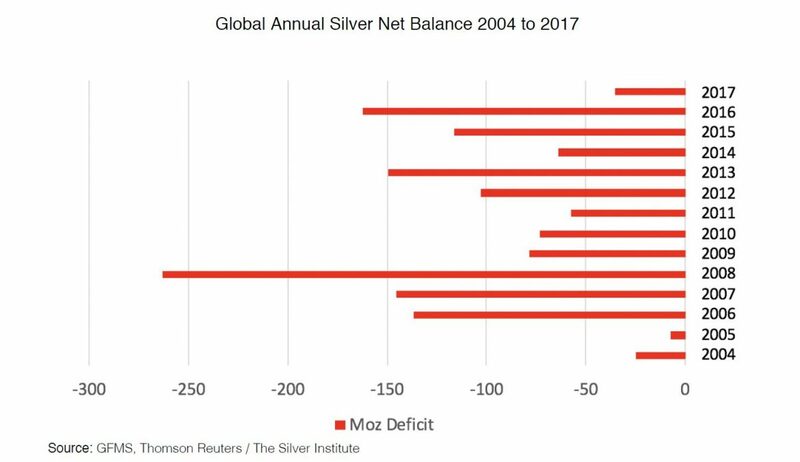 The long-term unsustainability of lower silver prices is producing a huge impact. Global mine production of silver has now experienced 3 consecutive years of falls, miners are faced with considerable headwinds with the falling price of the metal, huge and increasing costs of production, falling ore grades and a lack of silver exploration over the last 30 years has caused silver production to reach a peak. Forecasts clearly point to increased falls in production in the years ahead. The Perfect Storm – Growing global demand, annual production deficits and now falling mine production is pointing to a perfect storm, which can only end one way, a resolution in higher prices.